When a foot is more than a foot! 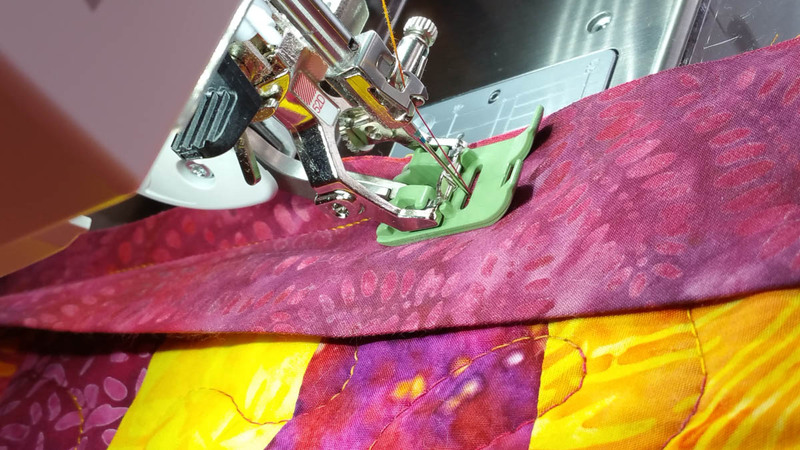 BERNINA Ambassador Heidi Lund shares why this BERNINA presser foot may come in handy on your next trip away from your sewing room. It’s time for that great getaway sewing retreat. You pack up all your sewing gear in the car which includes: Sewing machine, cords, feet, iron, ironing board, fabrics, templates, cutting board and rotary cutter, scissors and all those boxes of threads because you know you will need the color you left at home. 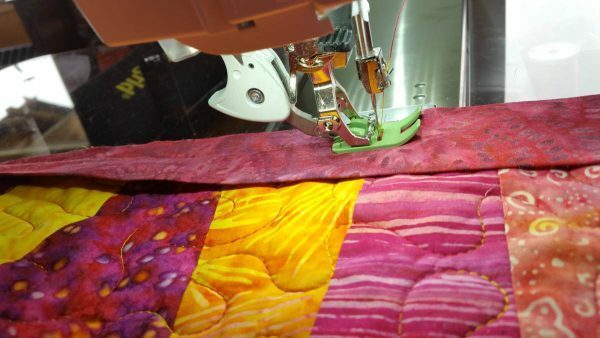 While on retreat, you finish your quilt and have blocked and trimmed the edges and are ready to add your binding. You go and look in your sewing box and realize that you left your BERNINA Walking foot at home. Have no fear, search thru your box of BERNINA presser feet again and pull out BERNINA Zigzag foot with non-stick sole #52D. I put this foot on my BERNINA 770 QE machine and engaged the BERNINA Dual Feed function on my machine. Ta da, it worked wonderfully. There was no pulling or pushing as that foot glided over my binding. It was a wonderfully smooth way to add a binding without spending time in the car driving all the way home to get my BERNINA Walking foot! I love my BERNINA 770 QE and how adaptive it is to my sewing needs. 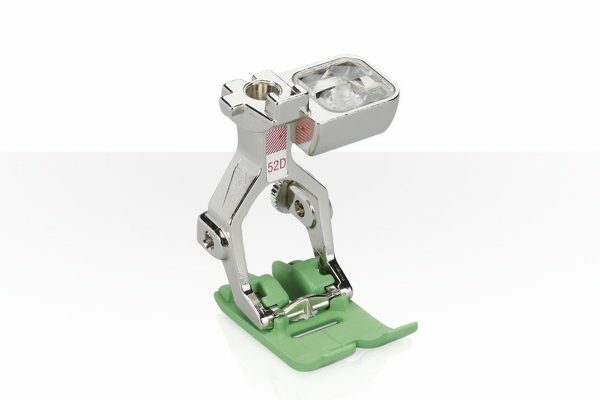 You can find more information about the BERNINA presser feet with sliding sole here. You’re a GENIUS! Best idea ever!!! Thanks Gwyn, I also used this same foot over the weekend to sew a clear plastic sleeve onto a oil cloth like “fastsigns” banner. The foot glided across the plastic, no problem. Best wishes for fantastic stitches! Super idea. I have a Bernina 880. Would this foot and procedure work with my dual feed? Absolutely this should work on your 880. The dual feed function made it sew like butter!